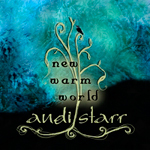 Andi Starr's latest release, Warm New World, arrived in my post with a note attached to the CD: 'listen to tracks 3, 5 & 11' (I think; I threw the note out). Whether the artist or her PR agent wrote the note I'm not sure, but my first thought was, 'This is going to be easy. Three songs and I'm done.' Well, when reviewing music, things are never that easy. Warm New World requires more than a sampling to get the full flavor of the work. Andi Starr's mostly quiet work of light and ambient alternative rock is not a style I normally have in rotation. Compared to Tori Amos and Jewel in the past, I know little of those artists, and would not even venture to make a comparison. If Starr was doing hard rock or heavy metal, then I'd have a point of reference. But a little listening outside the box is always a good thing for me. Andi Starr is a fine composer deftly blending acoustic guitar and piano into delicate and ethereal compositions. The mood of Warm New World is reflective, thoughtful and a slightly angst driven though without any pretentious navel-gazing. Starr's vocals are airy and mesmerizing, but sometimes loosely unintelligible as she often sounds like she singing with a lisp or through a plastic straw. Regardless, her style both compliments and expands her musical style. Between her vocals and arrangements she calms and subdues like a soothing pinot noir on a cool late afternoon. The suggested songs were Rebel Sky, Stardust, and Letter From a King; they're all fine songs, yet my favorite was the last, thanks to the horn arrangement. Alternatively, I would suggest Go To The Ocean, Crow, and the title track as some of the most delightful tracks. However, if this musical style is up your alley, then Warm New World is a complete and satisfying work. I think I'll pull it out just piss off my scarf-wearing, latte-sniffing pinhead friends who think us heavy metal kids have no culture or musical depth. Quite recommended. Andi Starr's ethereal and evocative ambient alt rock isn't my first choice in music. Yet her effective arrangements of acoustic guitar and piano mixed with her soothing, often soulful, vocals and poetic lyrics make Warm New World a compelling and delightful play (even for this heavy metal kid).